ANGUS STIRLING has had a distinguished career in the arts. He was Deputy Director of the Arts Council of Great Britain in the 1970s, and subsequently Director – General of the National Trust, and non-executive Chairman of the Royal Opera House , Covent Garden. He was for many years on the governing board of the Courtauld Institute of Art, of which he is an Honorary Fellow. Inheriting a love of painting from his mother and her forbears, Angus returned to painting in a dedicated way in 1995. He studied with Robin Child at the Lydgate Research Centre near Marlborough. In 2005 he began contributing to selected group exhibitions. In 2010 he had his first exhibition , jointly with his daughter Kitty Stirling, at Gallery 27, Cork Street, London. They have shared two further exhibitions , at the Lynda Cotton Gallery in Watchet, Somerset, in 2012 and 2016. Angus has exhibited regularly since 2011 through Catharine Miller at the Hollywood Road Gallery, Chelsea, and at London Art Fairs. His work is in many private collections both in the UK and overseas. He had a near sell-out solo exhibition with Catharine Miller in November 2016. Angus is interested in exploring the relationship between painting and music. 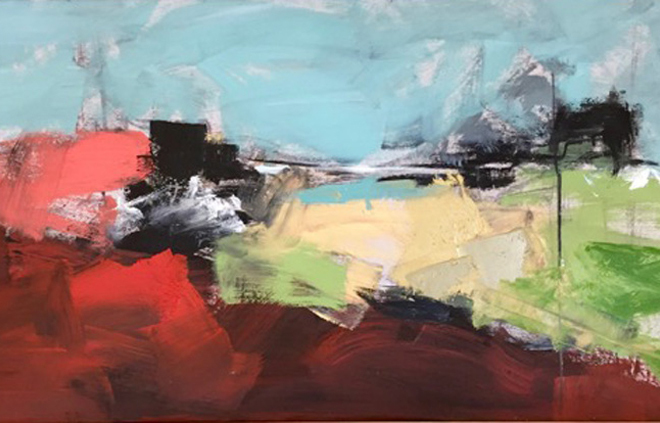 This is not to be interpreted as a literal concept, but in abstract terms where the key elements of composition – rhythm, form, tone, colour, energy and line are all common to both. Beyond these formal components of structure there is a search for something more elusive, a suggestion of mystery or unexplained meaning that invites contemplation. 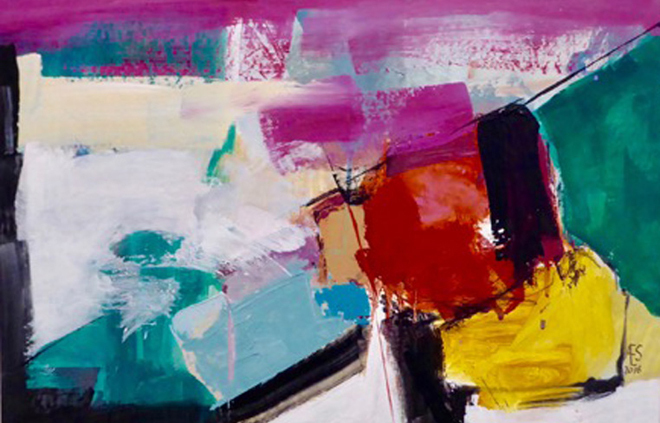 Colour plays a central part in Angus’s compositions, not only to enliven the surface but also to define space and form. He derives ideas from many different sources, including observation of nature and also from poetry. 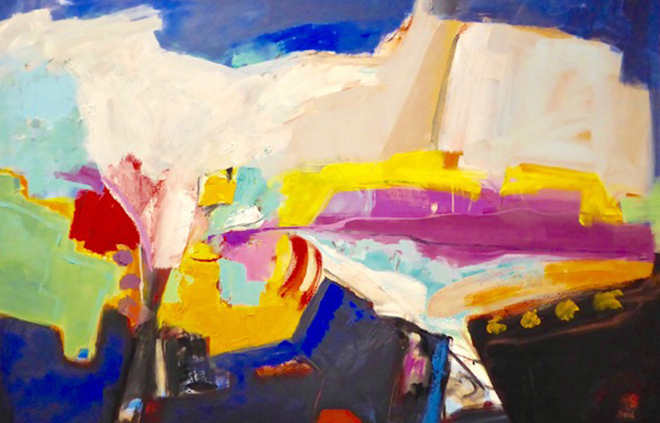 Artists who have been a major influence are Cezanne; the American Expressionists Diebenkorn, De Kooning and Frankenthaler; and among 20thc British artists, Ivon Hitchens and Keith Vaughan in particular. He usually works from drawings, and in different media, mainly oil and acrylic. He often begins by making marks that have no particular relation to the subject, the form of which gradually suggests itself as the work evolves. The process is comparable to a game of chess, with an opening, a middle and an end-game, each depending on the one before and on a successful integration of the whole. 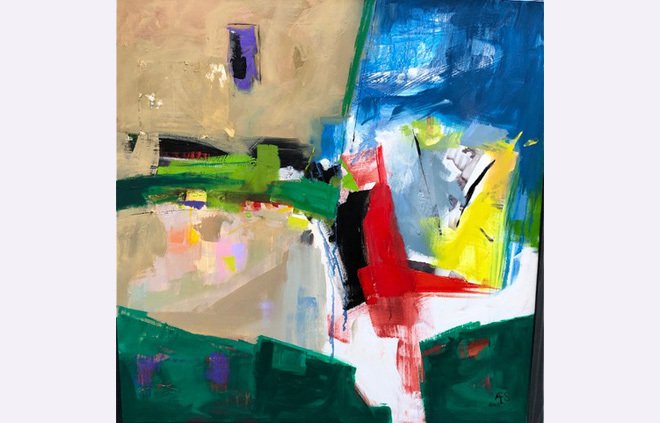 Angus’s aim is to create a personal re-incarnation of landscape, architecture, human form or still life that culminates in a work of imagination and originality.